At the Monday, Jan. 14 regular board meeting, Licking R-VIII School District Board of Education members were recognized for their dedicated service. (Front row, from left) Brad Smith (President), 14 years of service; Roy Kinder (Vice President), 15 years of service; Jason Derrickson (Secretary), 9 years of service; (back row, from left) Rawly Gorman, 7 years of service; Alan Quick, 2 years of service; Mike Hammond, 13 years of service; Jeremy Rinne, 1 year of service. Each year during the month of January or February, Licking R-VIII, along with school districts across the state, honor the countless contributions of these locally elected advocates for Missouri schoolchildren and public schools. “School board members tackle a difficult job and shoulder enormous responsibilities. 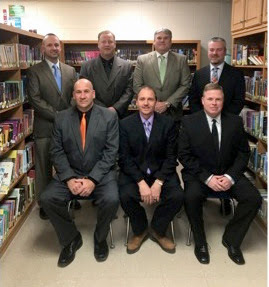 These men are elected to establish the policies that provide the framework for our public schools. They provide vision and leadership in their roles as volunteers, and they will continue to stand up for public education and guard against anything that takes away from our children or undermines our public schools,” says Cristina Irwin, Licking R-VIII School District superintendent. Our district benefits from the tireless work and countless hours contributed by these local citizens who work without pay. Serving as a crucial link between the community and classroom, our board is responsible for an annual budget of $7.2 million, 847 students, 131 employees, and all of our facilities on campus. It’s more important than ever before that our community supports public education so that today’s students are prepared to be productive citizens and the leaders of tomorrow. Please extend a thank you to each of our board members for caring about our children and giving so much to our community. Licking R-VIII School District would like to let them know that their dedicated service is recognized and truly appreciated.